I love setting the table for dinner, even if it is just my husband and I on what would otherwise be an "ordinary" weeknight meal of soup. I pulled out my favorite mix of napkins and my favorite serving trays. The best part about this recipe is that you can add any veggies to it that you'd like, or any protein. I also like to cute corners a bit and use a store bought rotisserie chicken when I can. I have served the soup on its own, in a bread bowl (my husbands favorite), with corn bread or with a crusty loaf of bread on the side. I have also served it with grilled cheese. Yum! 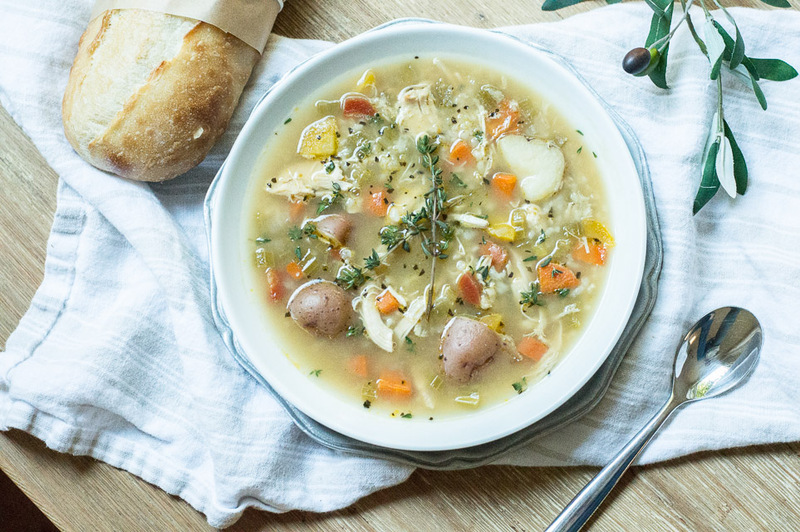 I hope the next time you're in need of a bowl of comfort, you give this recipe a try! I would love to know what you think of it it so be sure to comment below or on my Instagram. Heat oil in a large pot over medium heat. Saute onion, celery and carrots until softened, about 5 minutes. Stir in chicken broth and potatoes. Increase heat to high just until broth starts to boil. Reduce to medium high and cook potatoes for 10 minutes or until fork tender. 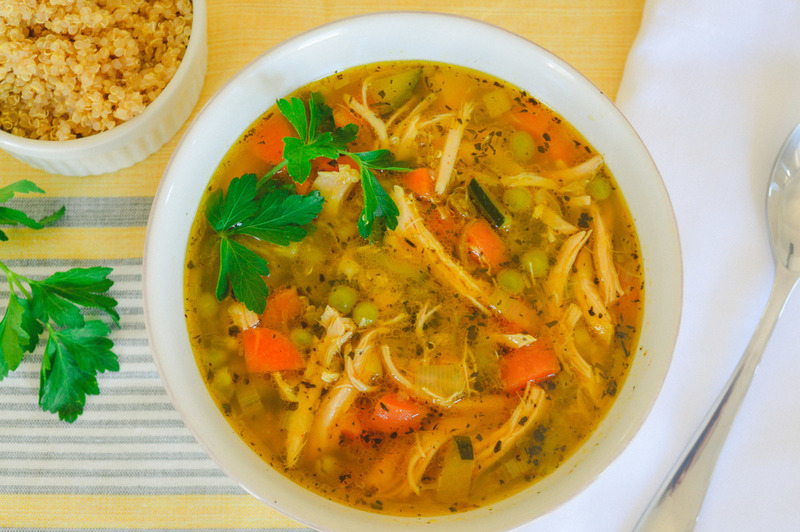 Reduce heat to low and stir in rice or quinoa, chicken, and dijon mustard. Season to taste with salt, pepper and season salt. Stir in fresh parsley and simmer. Serve and enjoy! It may officially be fall, but the weather sure is still making its full transition. Even on the warmest of fall days, I have found myself craving comfort food. I have also found myself craving easy weeknight meals.. This recipe for caprese spaghetti squash is the perfect transitional meal from summer to fall. Once everything is roasted, it is time to assemble the sphaghetti squash. I scrapped all of the spaghetti squash "noodles" out of the shell, sprinkled it with salt, and mixed it with marinara sauce. I placed the spaghetti squash "noodles" back into the shell and layered it with the oven roasted tomatoes, fresh basil leaves, mozzerella and parmesan cheese. 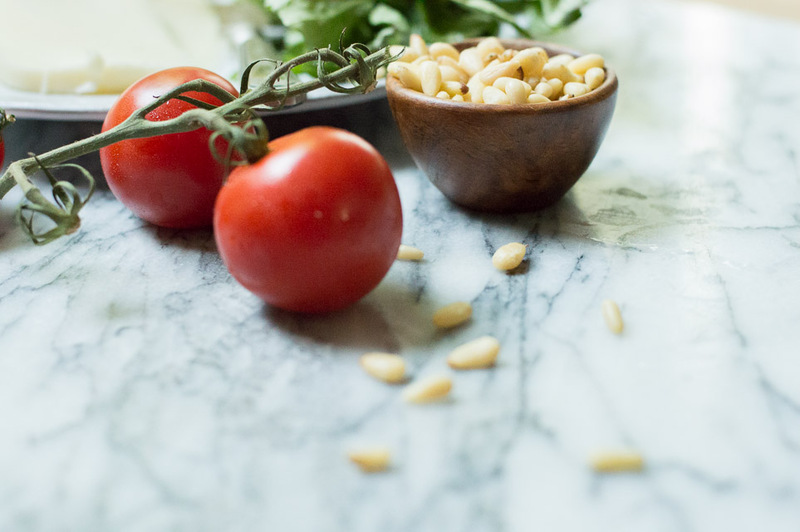 When I pulled them out of the oven, I sprinkled them with fresh basil and topped them with pine nuts. You could also add some additional cheese or any other toppings you'd like to them. Line a baking sheet with parchment paper or grease with olive oil or cooking spray. With a sharp knife, carefully cut spaghetti squash in half lengthwise. With a spoon, gently remove seeds and discard. Place spaghetti squash cut side down on baking sheet. Bake for 45 minutes or until a fork can pierce the shell easily. 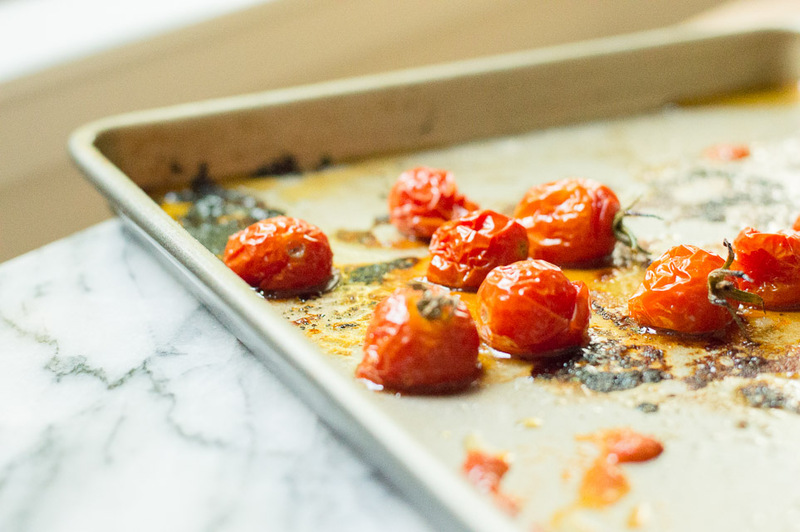 Place the tomatoes on a baking sheet and drizzle with olive oil. Sprinkle with the salt. During the last half of the squash cooking time, place the tomatoes in the oven and roast for approximately 20 minutes, until the tomatoes are shrivelled. Set aside. Remove both the squash and the tomatoes from the oven. When the squash is just cool enough to touch, flip the squash over. Turn the oven to broil. 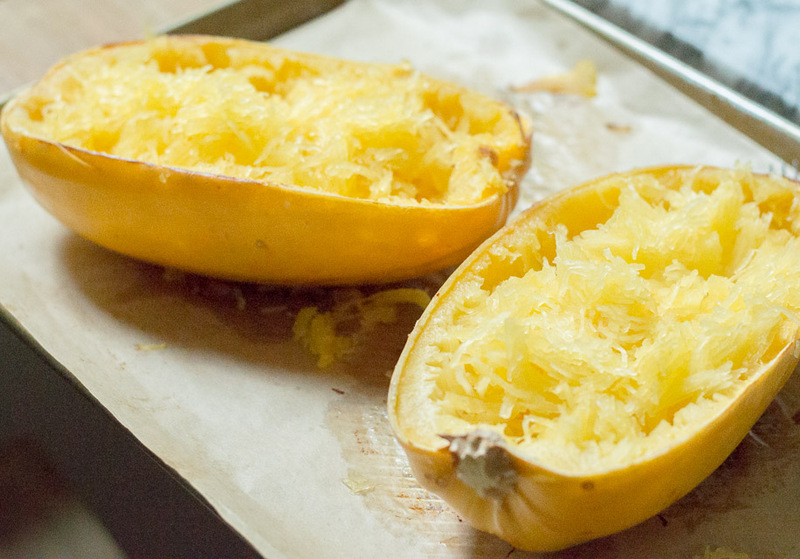 With a fork, loosen and separate spaghetti squash strands from shell. Reserve shells. Place strands in a bowl. Mix strands with salt (don't skip this step), and pasta sauce. Adjust the amount of sauce you use based on your own preference. Spoon mixture back into the empty shell. Sprinkle half of the fresh basil leaves and half of the cherry tomatoes on each squash half. 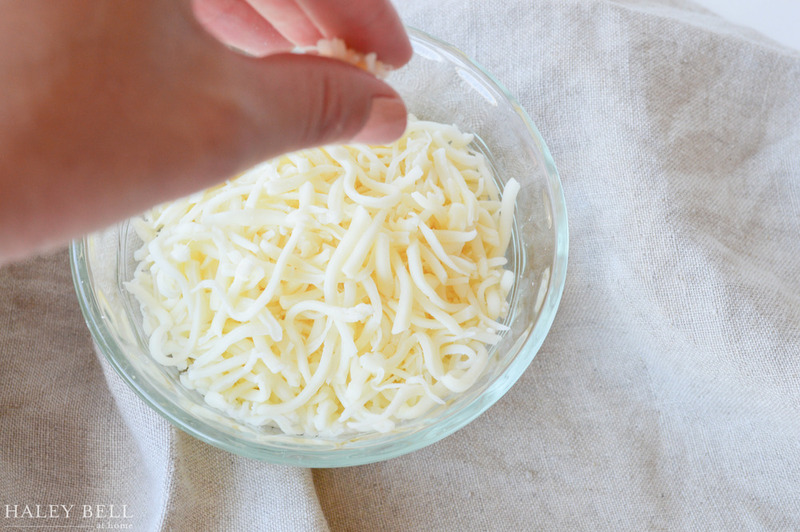 Grate the parmesan cheese over top and top each side with 3 slices of the mozzarella cheese. Broil for 3-4 minutes or until the cheese starts to melt. Top with additional basil (optional) and pine nuts. Serve and enjoy! Whenever I ask my readers what kind of recipes they want to see more of, there is always an overwhelming request for easy weeknight dinner recipes. I get it. Dinner can be a struggle to get on the table at the end of the day, and not to mention the dishes that follow. As much as I love spending time in the kitchen, I am always challenging myself to come up with healthy meal ideas that can be made ahead of time, and that require very few dishes. Now, before you roll your eyes at a salad recipe, hear me out on this one. This salad is so versatile, pretty much any type of veggies and protein work. And the best part is that you can make the dressing, assemble the salad and even cook the protein ahead of time. This recipe definitely checks all the boxes which makes for the perfect weeknight (or any night) dinner solution! I used fresh salmon in this recipe, but chicken, steak or any other kind of protein would be great. You could even pick up a rotisserie chicken from the store to make things even easier! To make this salad ahead of time, I made the dressing (recipe below) and put it in a jar in the fridge. I then washed and cut up the lettuce and veggies, and assembled them on a platter. You could either cook the protein ahead of time or wait until right before you are going to serve it. I put plastic wrap on it and stuck it in the fridge and when I got home from a long day, dinner was done and ready to eat! Preheat the oven to 375 degrees. Drizzle olive oil and salt and pepper on salmon filets. On a prepared baking sheet, place the salmon into the oven for 15-20 minutes or until flakey. Arrange the greens on a large serving platter. Arrange the other veggies around the platter. Mix all of the dressing ingredients until well combined. 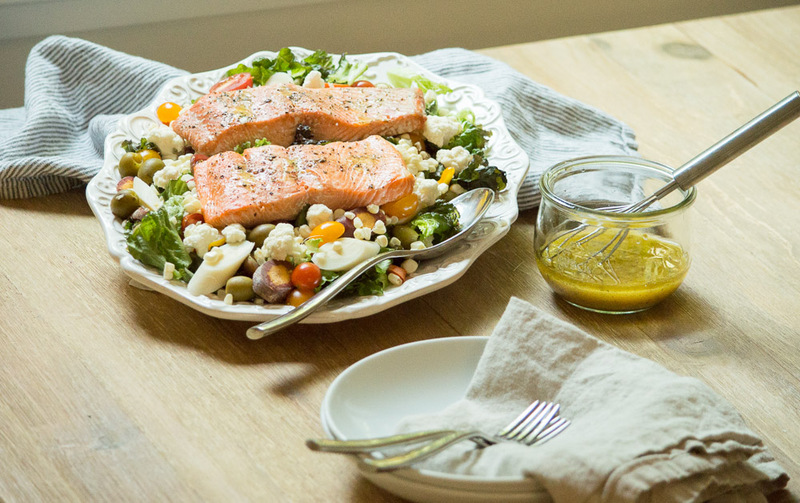 Place the salmon on top of the salad. Drizzle the salad with vinaigrette dressing, and enjoy! *The vinaigrette recipe was adapted from this source. The warmth of summer is here and I couldn't be happier about it! As sad as I am to see the spring season go, I am looking forward to the easy living the Summer months provide. We recently added a golden retriever puppy to our family, so in between keeping up with her and our work schedules, I am always looking for simple yet delicious dinner ideas. 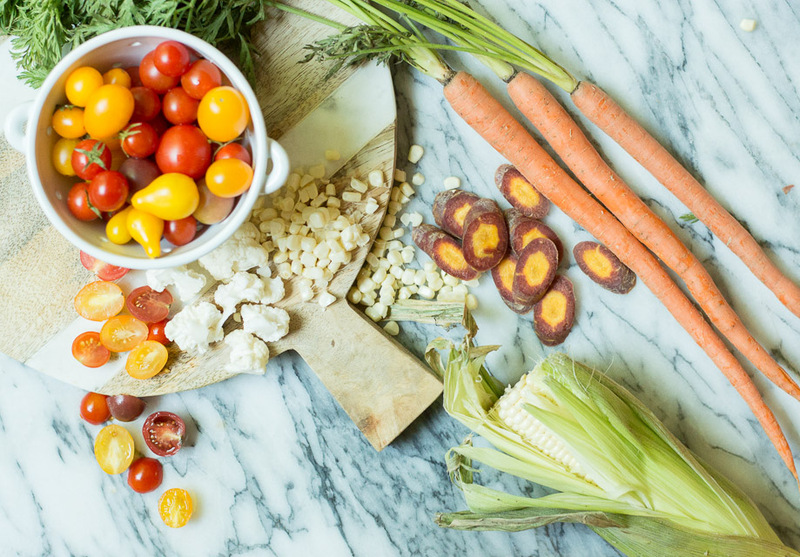 This recipe was inspired by my recent trip to our farmer's market where I was so excited to see the most beautiful tomatoes and bundles of fresh basil. This blistered tomato, burrata and pesto flatbread comes together in minutes and is loaded with amazing flavor. When you use quality ingredients, you don't need to add a lot to them. I used a mix of fresh cherry tomatoes, sliced shallots and drizzled them with olive oil and Maldon sea salt. If you are making this for a party, you could do this step ahead of time and then just reheat them right before placing them on the flatbread. The smell you get from the blistered tomatoes is amazing! It always reminds me of when I'm shopping in a William Sonoma store. Have you ever noticed how amazing it always smells in that store? Assembling the flatbread is so simple. I spread a few spoonfuls of the pesto on top of the flatbread, added torn pieces of the burrata cheese, and topped it with the blistered tomatoes. For a little kick, I also added a few red pepper flakes. I can't even tell you how incredible this flavor combination is! This flatbread is perfect as an appetizer for a summer party or it makes for an amazing easy dinner served along side a summer salad. It can also easily be altered to fit any dietary restrictions with a gluten free crust, dairy free cheese, etc. Preheat the broiler. In a medium baking dish, toss the cherry tomatoes, shallot and olive oil and season with Maldon sea salt and cracked black pepper. Place under the broiler for about 5 minutes, or until the tomatoes pop and are lightly brown. Preheat the oven to 400 (450 degrees for pizza dough) degrees. Place the flatbread on a baking sheet and lightly brush olive oil on top. Bake for 3-5 minutes (for pizza dough 8-12 minutes) till golden. Remove from oven and top with pesto and torn fresh burrata cheese. Let the burrata melt (can place back in the oven for a minute to speed up the process) before topping with the blistered tomatoes. Sprinkle with crushed red pepper flakes (optional). Slice and enjoy! There is nothing quite like a warm Spring day! We have been having a few of them lately here in California (don't worry- we have rain in the forecast all week), so we have been soaking it up. 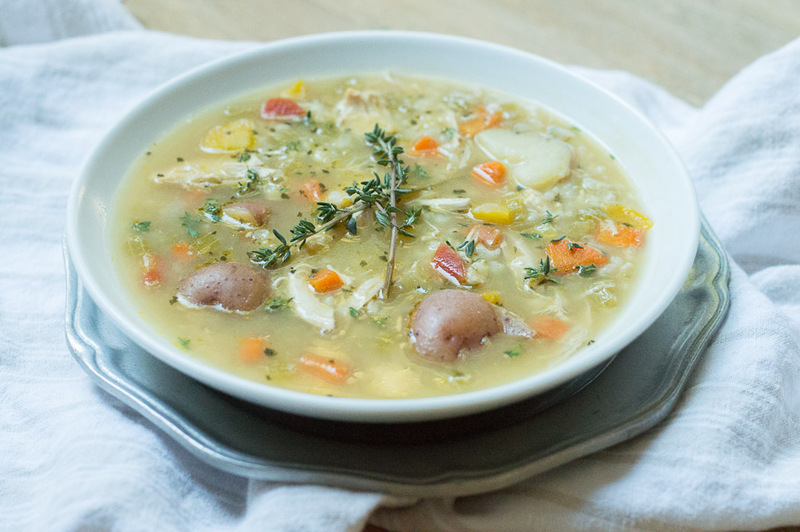 The warmer weather makes me want to swap out soups and stews for some lighter meals. That's what lead me to create this amazing avocado pesto "pasta" with blistered tomatoes. It is so light yet creamy and it's perfect on its own or next to some grilled chicken or salmon. It also comes together in minutes making it the perfect weeknight meal. I hope you make this one of your go-to dishes this Spring and throughout the Summer months ahead. Have you ever spiralized zucchini to create zucchini "noodles"? That's probably a silly question since it's been a food craze for a while. But, I have to admit this was my first time trying it. And now, I get all the hype! They were the perfect "noodle" for this dish since the avocado pesto perfectly coats them. You could certainly use regular pasta noodles in this dish (I won't judge)! I used my Vitamix blender to make the pesto sauce and it worked great! You could also use a food processor as well. If you find that your sauce is too thick for your taste, you can always add an extra drizzle of olive oil and/or lemon juice to thin it out a bit. Or, if you are using regular pasta noodles, you could add some of the cooking water to the sauce. The blistered tomatoes not only give this dish a nice color, but they also add a slight sweetness! To plate this dish, I simply tossed the zucchini noodles with the sauce and piled it on the plate with the blistered tomatoes. To finish it off, I grated some fresh parmesan cheese on top and it is perfection! You could also add some fresh cracked pepper and salt to taste. Put all of the pesto ingredients into a blender or food processor and pulse until smooth. Set aside. Heat the cherry tomatoes with a drizzle of olive oil in a large skillet over medium high heat. Gently shake the pan to get them moving. 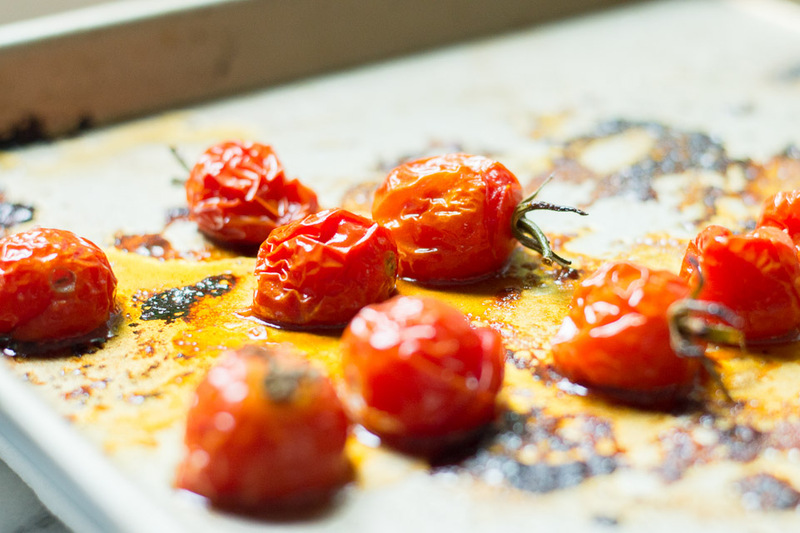 Continue cooking until the tomatoes are roasty and the skins are split or loosened. Remove from heat and set aside. 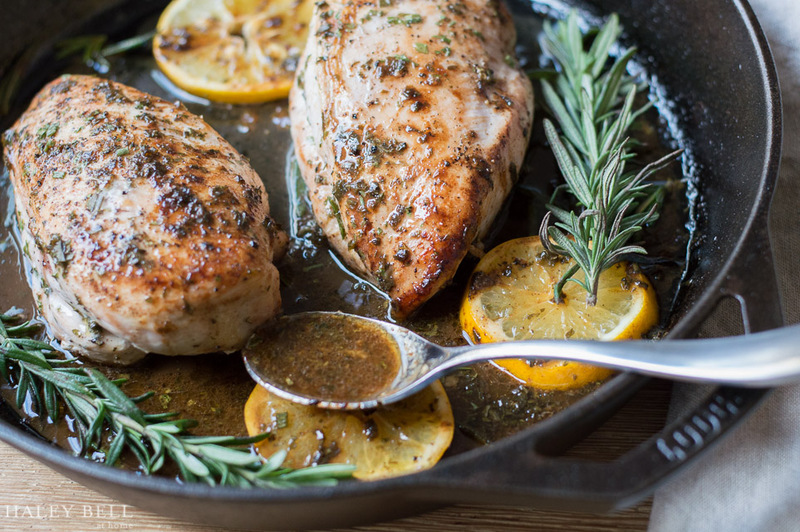 Bring a separate pan to medium high heat with a drizzle of olive oil. Add the spiralized zucchini. Toss for 1-2 minutes, until tender-crisp. Remove the pan from the heat and combine the zucchini with the pesto sauce. Toss until combined. Season with salt and pepper, top with tomatoes and sprinkle with parmesan cheese. Serve immediately. Note: I am on the conservative side with garlic, so if you like your garlic flavor strong, add an extra clove or two. As I sit here sipping warm lemon tea on a rainy afternoon, I am reminded of why this recipe came so easily to me. This season, in particular, I have been obsessed with citrus as well as getting healthy meals on the table. Through those series of events, I combined the two ideas and this incredibly easy, delicious and healthy lemon chicken recipe was born! It is packed with all of my favorite flavors and pairs well with just about any sides you serve it with. I know you might be thinking to yourself, "another chicken recipe, how good can it be?" I think when you choose a few high quality ingredients, "another chicken recipe" can be transformed. I absolutely love Meyer lemons, so I used them in this recipe and it gives this dish amazing flavor! I seasoned and seared both sides of the chicken breasts before I added the lemon and herb sauce to it. I then finished it in the oven. This allows the chicken to get a good sear while not drying it out. To lock in all of the amazing flavors this dish has to offer, I spooned the mixture over the dish throughout the cooking time. This also helped keep the chicken juicy and tender. My husband and I have been making more of an effort to eat dinner at the dinner table instead of piecing a meal together in front of the TV. For some this may sound easy, while others it might be a struggle. With a very simple table setting, this was the perfect meal for my husband and I to enjoy together. Recipes like this allow you to get dinner on the table quickly so you can focus on what's really important. Melt butter in a medium cast iron skillet over medium-high heat. Add chicken and sprinkle with salt and pepper. Cook chicken 2-3 minutes per side, until browned but not cooked all the way through. In a separate bowl, combine the chicken broth, lemon juice, herbs, salt and pepper and seasoning salt. Pour the sauce directly over the chicken in the pan. Bake for 20-30 minutes or until the chicken has cooked through. Spoon the sauce from the pan over the chicken every 5-10 minutes. Garnish with fresh rosemary and lemon slices and enjoy! Since moving back to Northern California, my husband and I are thoroughly enjoying the Fall season! While living in Southern California, we didn't realize how much we missed the changing of the leaves, crisp mornings and nights, and enjoying all of the yummy seasonal produce. When we were at the farmers market this past weekend, it was hard to miss all of the gorgeous beets and carrots. Their colors alone screamed fall. I had been craving easy, delicious and healthy fall side dishes, and I knew these beets and carrots would be perfect topped with creamy burrata cheese and pepitas! I have found myself roasting any and all veggies this fall season. There is something so comforting and simple about them. What I love most about roasting beets and carrots is the slight earthyness and sweetness you get from them. I drizzled them with some olive oil and seasoned them with sea salt before popping them into the oven. While the vegetables were roasting, I made a very simple vinaigrette to pour over the top of the salad once it was assembled. I also sauteed the beet greens in a pan so that they were slightly wilted. I had never actually eaten the beet greens before, and they were a nice component to this dish. You could also use chard or spinach if you prefer. I love putting this dish on a big platter and layering the ingredients starting with the beet greens and topping it all off with the burrata and pepitas. It makes for a beautiful presentation. This dish pairs well with just about anything! We enjoyed it along side some herb chicken for a simple rainy night meal. It would also be great on your Thanksgiving table perhaps with a cup of soup or on its own for a vegetarian meal with a loaf of crusty bread. I hope you give this incredibly yummy and nourishing dish a try this fall or winter season! Cut the tops of the beets, reserving the beet greens. Cut the ribs of the greens off, and cut the beet greens into bitesize pieces. Set the greens aside. Scrub the beets clean. Half and slice the beets into about 1/4 inch thick slices. Keep the red beets separate from the rest of the vegetables if you don't want the colors to bleed. Spread the vegetables in an even layer on sheet pans. Again, keeping the red beets separate if you don't want the colors to bleed. Roast in the oven for about 25-30 minutes, or until they are fork tender and browned. In the meantime, combine the vinaigrette dressing ingredients. Whisk to combine and set aside. With a few minutes remaining in the vegetable cook time, heat a skillet over medium with a drizzle of olive oil. Add the beet greens and lightly sautee for a few minutes, until they are slightly wilted. Trasfer to a platter. Layer the beets and carrots over the beet greens. Using your hands, break bite size pieces of the burrata cheese and place over the vegetables. Drizzle the dressing and top with fresh thyme and pepitas. Serve the salad warm or cold and enjoy! My current Summer obsession is salads! But not just your typical lettuce and veggies, although you can never go wrong with that. I had a watermelon left over from the 4th of July holiday, so I sliced it up with some fresh cucumbers, feta cheese and mint and it cured my salad cravings. It is perfect for lunch on a hot day or BBQ out on the patio for dinner. I started by scoring the watermelon on the diagonal and then horizonally, which created 1 inch cubes. I also cut up the cucumber and feta cheese into 1 inch cubes so all of the ingredients were about the same in size. This salad is amazing because it comes together so quickly! Once all of the ingredients were chopped up, I thinly sliced mint and made a vinaigrette dressing to top the salad with. I love all of the flavor you get from the liberal amount of freshly ground pepper and the fresh mint. This salad has the perfect balance of salty sweet. This recipe makes enough for two, so my husband and I enjoyed it along side some grilled chicken for dinner and it was amazing! You could certainly double or triple the recipe for a crowd. Cut the watermelon, cucumber and feta cheese into 1 inch cubes. Thinly slice mint. Add all ingredients to a large bowl. Mix the olive oil, balsamic vinegar and salt and pepper. Pour over the ingredients and toss until well combined. Place in the refrigerator and let sit for 10-15 minutes for the flavors to blend. We were greeted with a heat wave to kick off the first official days of summer here in California. Are you getting the heat where you are? It seems as though any lingering gloomy weather has disappeared and the heat is here to stay. All of which led me to create this amazingly easy and fresh grilled corn, tomato and avocado salad. These few simple ingredients are transformed into the perfect salad to serve at a BBQ or to keep on hand for an easy lunch or dinner during the summer months. I always get so excited when the produce at the farmers market changes with the seasons. I found this fresh white corn at my local farmers market and I love the way it tastes in this dish. It gives it a nice crunch and slight sweetness. You could certainly use fresh yellow corn as well. Tomatoes are also a summer staple in our house! There really is nothing like having vine ripe tomatoes to put in a summer salad. Once I gathered and washed all of the produce, this salad comes together very quickly! I simply grilled the corn for a few minutes so that it got a little char but I didn't cook it all the way so it remained tender and crisp. I also had some fresh mozzarella cheese on hand and since I am a big fan of adding cheese to my salads, I just had to add it! Feta cheese would also be amazing. What you end up with, is the perfect mix of summer flavors, a nice crunch from the corn and slight creaminess from the avocado and cheese. The best part about this salad is that you can make it ahead of time (add the avocado before serving) and you don't have to heat up the kitchen to make it! My husband and I enjoyed this along side some freshly grilled salmon and it was amazing! I also packed up some for a BBQ and put it in my favorite jars. It was not only easy to make and transport, but everyone loved the individual servings! Shuck the ears of corn and brush lightly with olive oil. Grill the corn for about 5-7 minutes, turning often until slightly charred. Cool the corn and cut it from the cobs. Whisk the olive oil and red wine vinegar in a bowl to blend. In a medium bowl combine the tomatoes, avocados, and mozzarella cheese with the cooled corn. Add the chopped cilantro. Pour the olive oil and red wine vinegar dressing over the salad. Sprinkle with freshly cracked pepper and salt to taste. Toss to combine. Recently I have found myself wanting to cook healthier meals that have simple yet quality ingredients. I think it has something to do with the warmer temperatures and the looming bikini season coming up. I took all of my current favorite seasonal vegetables and came up with this delicious and simple grilled asparagus and caprese salad. It is perfect for a spring or summer night! I found these gorgeous asparagus at my local farmers market that I could not pass up! I like to buy the stalkier asparagus whenever I am grilling them since they hold up better. I started by tossing them in olive oil and sprinkled them with sea salt before grilling for about 6-8 minutes. While the asparagus were grilling, I prepped the rest of the ingredients. I found a mix of red and yellow cherry tomatoes that I sliced in half and mixed with good olive oil, red wine vinegar, and sea salt. The next thing I did was finely slice some fresh basil leaves. I absolutely love the smell of fresh basil in the kitchen! It instantly makes me feel like I am in Italy making a fancy meal, even on the most ordinary of week nights. Assembling this dish is so incredibly easy. I started with the grilled asparagus as the bottom layer and then added in some feta cheese to the tomato mixture before I poured it on top. You could also use goat cheese, mozzarella, or cotija; these would all be amazing as well. The addition of the cheese breaks up all of the veggies and gives it a nice salty flavor. Once you sprinkle the cheese on top, it's time to enjoy it! My husband and I enjoyed this dish along side grilled chicken but it would be a great side dish to any protein. The best part about grilling dinner is that it makes for super easy cleanup in the kitchen after (score!). Cheers to kicking off grilling season and warmer evenings! I would love to know what you think of this recipe, so be sure to comment below or on my Instagram. Wash and dry the asparagus. Remove the tough ends of the asparagus by snapping it at its tender point at the bottom. Drizzle 2 Tbs. of the olive oil and sprinkle with sea salt. Spread the asparagus on the grill and grill for about 6-8 minutes, turning once until they are slightly charred. Remove from the grill and set aside. In a small bowl whisk 2 Tbs. of the olive oil with the red wine vinegar and 1/2 tsp. sea salt. Slice the tomatoes in half and add to the bowl. Chiffonade or thinly slice the basil and add to the bowl. Stir the mixture completely. To assemble, place the asparagus on the bottom and top with the tomato and basil mixture (down the center). Top with crumbled feta cheese and sprinkle with sea salt and freshly ground pepper to taste. Serve warm or cold and enjoy! With Super Bowl Sunday just days away, it got me thinking: what food are we going to serve? Let's be honest- it's all about the food, right? No matter what team you are cheering for, having good food that is not only delicious but easy to eat, is key. I also like to try to avoid filling up on food that completely weighs you down and has you in a food coma for days. That's when the idea of lightening up the classic cheeseburger popped into my mind. I used roasted sweet potatoes in place of traditional hamburger buns, and used ground turkey to create sweet potato sliders. They turned out to be a huge success, even for the pickiest of football fans in our house! You want to cook the sweet potatoes until they have slightly browned around the edges so that they hold up to the meat of the burger. You can also make these ahead of time and then just warm them back up in the oven for a few minutes when you are ready to serve them. We chose to use ground turkey and melted cheddar jack cheese on top, but you could use any ground meat and cheese combo that you'd like. I love to create a condiment station to house all of our favorite burger toppers. I stuck with the classics on this one, but the possibilities are endless. You could caramelize onions and mushrooms, bacon, pickles, and on and on! We used Sir Kensingonton's ketchup and mustard since they are all natural and my husband and I love them. You could either assemble the sliders and serve them on a platter, or you could create a burger bar for everyone to make their own. Since they are bite sized, I chose to preassemble ours with all the fixin's and they were a big hit! I hope you give these sweet potato sliders a try and love them as much as we did. Cheers to a fun Super Bowl Sunday filled with lots of delicious eats! Optional toppings: small thinly sliced tomatoes, lettuce torn into bite sized pieces, avocado slices, ketchup and mustard. Shape ground meat into 8-10 mini patties. Size them according to the size of your sweet potato slices. Season them with salt and pepper and set aside. Preheat the oven to 400 degrees. Slice the sweet potatoes into 1/4 in. thick slices. Brush with olive oil on both sides and season them with salt and pepper. Roast in the oven for 15-20 minutes (flipping halfway through), or until the edges are slightly crispy. While the potatoes are cooking, heat a skillet with olive oil to medium high heat. Place the turkey patties in the skillet and cook for 3-4 minutes per side, until they are cooked all the way through. Assemble the burgers, placing the mini burger in between the two sweet potato slices and garnish with your favorite toppings! Sunday evenings in our house means one of two things: making a home cooked meal together or ordering pizza. My husband usually pulls for the latter (shocker!). Since I try not to eat pizza all the time, I always order a salad to go with it. Thankfully our favorite local pizza spot has this amazing kale and mint salad with golden raisins, almonds, parmesan cheese and a lemon vinaigrette that I fell in love with. I found myself craving it throughout the week, so I decided to recreate it at home. I started by shredding a large bundle of lacinato kale that I picked up from the farmers market. I prefer lacinato kale to curly kale since it is slightly sweeter and less bitter but you could certainly use whatever you have on hand. The golden raisins add a slight sweetness while the almonds add a nice crunch. In the past whenever I had almonds on a salad, I always had toasted sliced almonds but I had never had raw almonds. To my surprise, leaving the almonds in their almost natural state adds a lot to the overall dish. The lemon vinaigrette on the salad from the pizza joint has a slight sweetness and creaminess so I wanted to mirror those flavors. I played around a bit and came up with a slightly sweetened lemon vinaigrette using all natural honey and dijon mustard and it is amazing! Definitely don't skimp on the dressing! The kale absorbs the dressing well, so you can either dress the salad ahead of time or drizzle it on top before serving. To top off the salad, I added freshly grated parmesan cheese because let's be honest- you can never have enough cheese! Having this amazing kale salad recipe reminiscent of our favorite pizza spot might not stop my husband from ordering pizza on Sunday nights, but at least I have found a better alternative! You can enjoy this as a side salad with your meal, or you can add chicken or steak to make it a complete meal. Whatever you choose, I hope you love it as much as I do! Combine all of the dressing ingredients and set aside. Wash and shred the kale and mint into thin strips. Add to a bowl and top with the almonds and golden raisins. Toss the salad with the dressing and top with freshly grated parmesan cheese. *Salad dressing recipe adapted from this recipe. As the seasons begin to transition, so do our cravings. Popsicles are replaced with warm baked goods, the BBQ is replaced with the slow cooker, and salads are replaced with warm sandwiches. Sandwiches like this grilled cheese with spinach and prosciutto. The inspiration for this grilled cheese sandwich came from my recent trip to the farmers market. It felt like Fall was in the air (at least for the day) and I stumbled upon this gorgeous loaf of freshly baked sourdough bread that was just begging me to take it home. Being that my husband absolutely loves carbs in all forms, I knew he would be excited when I brought it home, let alone my plans for it. I picked up a fresh bag of spinach, and added my other two favorite ingredients of cheese and prosciutto and this made for a seriously amazing grilled cheese sandwich! The best grilled cheese sandwich I've ever had kind of amazing. In my opinion, the key to a good grilled cheese sandwich (besides the gooey cheese) is good quality bread and butter. My favorite recent addition to my grilled cheese sandwich is topping them off with maldon salt. One of my girlfriends told me this secret and my grilled cheese sandwiches will never be the same. It takes them to a whole new level, you have got to try it! When my husband and I were indulging in these for dinner, we were talking about how amazing these will be dunked in soup this winter. A nice creamy tomato or chicken broth based soup would be amazing in addition to these sandwiches. The next time you're craving comfort food, are feeding a crowd or need something to dunk into your soup be sure to add this to your list- and don't forget the salt! Spread butter on the bottom and top half of the bread. Place a handful of the shredded cheese atop one of the slices of bread. Add the slices of prosciutto and spinach. Add the remaining handful of shredded cheese. Top with the second slice of bread, butter side up. Grease a cast iron skillet liberally with butter over medium heat. Grill the sandwich until the cheese has melted, about 4-5 minutes per side. Top with maldon salt and serve immediately and enjoy. We have had quite an unusual Summer weather wise here in Southern California. Unseasonable thunder and lightning, rain and humidity has become the norm lately. Since we don't have air conditioning, this means our fans are running around the clock and it also means you don't want to heat up the kitchen. 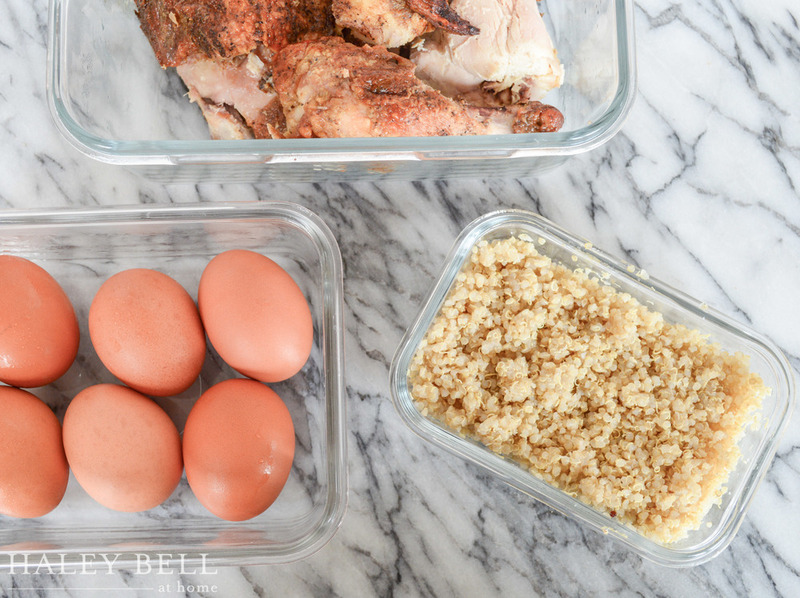 I have been looking for meal solutions that are both easy and satisfying. This grilled peach and arugula salad checked all of the boxes! I picked up a big bag of peaches and arugula from our farmer's market to take advantage of the Summertime fruits and veggies. The salad is dressed with a simple vinaigrette which is a nice combination of tang with a slight sweetnesss and topped with the nuttiness of the pecans, and saltiness of the cheese. It is the perfect Summer dish! Before I put the peaches on the grill, I brushed some of the vinaigrette on them which helped from sticking to the grill and gave them great flavor. The peaches only need to be grilled for a couple minutes per side until you get good grill marks and the peaches have softened. This salad is perfect on its own for a light lunch (you could also add protein to it) or it makes for a great side salad for dinner. 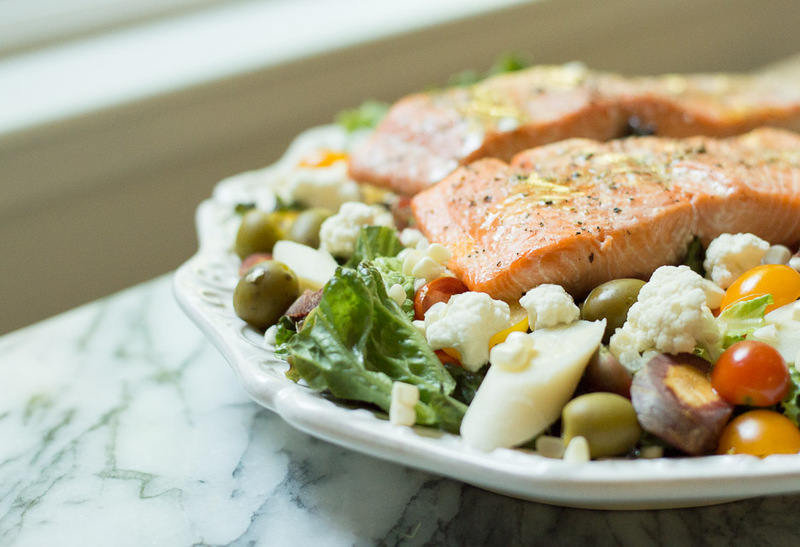 You could also put the salad on a large platter and serve it family style for dinner. No matter how you decide to make it, the flavor combination will not disappoint! My favorite part of making any salad is putting all of the ingredients together. I tossed the arugula with the dressing, added the grilled sliced peaches, cheese and finished it with the pecans. To top it off, I added another drizzle of dressing and a few flakes of maldon salt. I hope you add this peach and arugula salad to your Summer menu and it helps you beat the heat! To make the dressing, whisk together the olive oil, vinegar, honey, salt and pepper. Set aside. Warm the grill to high heat. Cut the peaches in half, removing the pits, and brush with the vinaigrette. Place the peaches directly on the grill, cut side down. Grill for a few minutes until the peaches have softened and have grill marks. Remove the peaches onto a cutting board, slice, and let cool to room temperature. Toss the salad with a 1/4 of the dressing and top with the peaches, cheese, and pecans. Finish the salads by drizzling the remaining dressing and maldon salt on top. Serve and enjoy! I love this time of year! The 4th of July holiday is approaching, the evenings are longer and the living feels a bit easier. It is also a time where I look to simplify meals without compromising on flavor to spend more time outdoors. This greek yogurt coleslaw recipe is a healthier alternative to the traditional and is incredibly easy to whip up. Paired with slow cooker pulled BBQ chicken sandwhiches (recipe below), and you've got a delicious and easy Summer time meal. The coleslaw dressing is creamy but light so it won't weigh the slaw down. It makes for a great standalone side dish or part of the main dish. I recommend making the dressing ahead of time, keeping it in the refrigerator to let the flavors combine, and then pulling it out when you are ready to assemble and serve. These sandwhiches are perfect for entertaining since everything can be prepared ahead of time and served when your guests arrive. It makes for a great sandwhich bar where your guests can assemble their own which is not only fun but also allows for less time in the kitchen and more time with your guests! This recipe also travels well, so be sure to add this to your Summer menu if you need to bring a dish to a party. I hope you enjoy this recipe amongst good company this Summer! I would love to hear how you like the recipe, so be sure to comment below or on my Instagram account. Greek Yogurt Coleslaw, recipe adapted from here. Directions: Mix all of the dressing ingredients together until well combined. Put the dressing in the refrigerator for a minimum of 1 hour. Combine the shredded cabbage, carrots and green onion in a bowl. Pour the creamy dressing on top, toss and serve! Directions: Put the chicken breasts at the bottom of the slow cooker and pour the BBQ sauce on top. Toss the chicken to combine. Cover with the lid and cook on low for 6-8 hours or high for 3-4 hours (depending on your slow cooker) until the chicken is fully cooked and shreds easily. In a separate bowl, shred the chicken using two forks. Return the chicken to the slow cooker and toss to soak up the reaming juices. 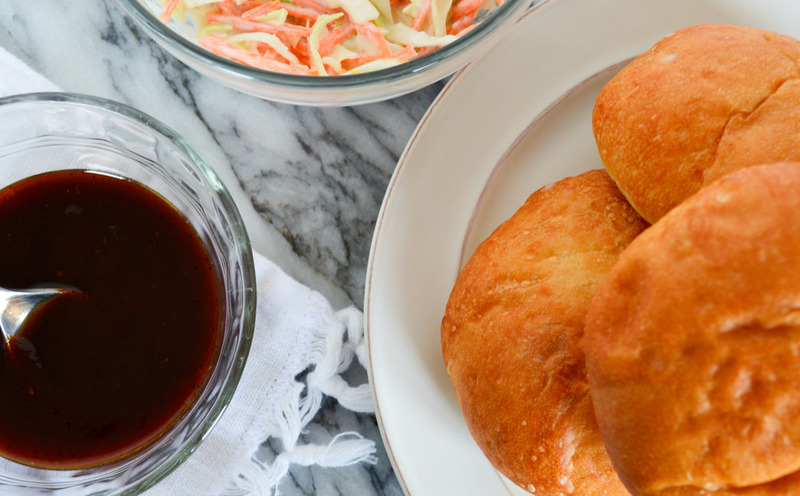 Serve with buns, coleslaw and enjoy! Taking time each week to prep some homemade staples to keep in the fridge, is key for me! I get asked all the time what some of my staples are, so I am finally sharing them with you. These are in addition to stocking the pantry and fridge with healthy food each week, which I will be sharing in a separate blog post. I choose a day each week (usually Sunday or Monday) to prepare these go-to items so I can just grab them as needed. 1. Almond Milk. Ever since I posted about making this homemade almond milk recipe, I have been making a weekly batch ever since. I love to use it in my morning tea or coffee, baked goods, chia seed pudding, oatmeal, desserts, etc. It is also amazing to have a glass on its own! 2. Chia Seed Pudding. I recently started making this for a quick breakfast and absolutely love it because it contains 2 ingredients and is delicious! Combine 1 cup of almond milk (above) and 3 Tbs. chia seeds. Mix it together and leave it in the fridge overnight and you have breakfast in the morning. I like to top mine with fruit and nuts! 3. Homemade Salad Dressing. I grew up on my mom's homemade salad dressing recipe and absolutely love it. In a jar combine 2 Tbs. olive oil, 1 Tbs. vinegar (of your choice), 1 Tbs. dijon mustard and salt and pepper. Shake it to combine and leave it in the fridge to enjoy on your salads throughout the week. I usually double the recipe for a whole weeks worth. You can also add other flavor enhancers: herbs, garlic or shallots, seasoning salts, etc. 1. Cooked Quinoa. I love having quinoa on hand to add to salads, breakfasts, or as a side dish. I usually make 1-2 cups cooked quinoa which is plenty for my husband and I to get through the week. 2. Hardboiled Eggs. In addition to fresh eggs, I like to have half a dozen hardboiled eggs on hand for my husband to take to work as an easy breakfast. They also make for a great salad topper or snack! 3. Cooked Poultry. I love to have grilled or baked poultry of some kind on hand. I usually have chicken, steak or shrimp that I can easily take from the fridge to make a salad or add to a main dish. It takes the guesswork out of lunch for me! As expressed above, these staple items are in addition to the fruits, vegetables, dairy, poultry and pantry items that I keep on hand. I would love to know what some of your staple items are, so be sure to comment below! One of the things I love so much about the weather transitioning to Summer is that is has be craving more salads. I have been trying to mix up my traditional salads and that's where the craving for this spicy shrimp and quinoa salad came into play. Wow, it is good! Let me start out by saying that I am not a fan of really spicy food and I loved this. It is a mild heat with the mix of the chili powder and paprika in the shrimp marinade. You could certainly add more of less heat depending on your liking. This salad is healthy and the ingredients are clean and easy to prepare. You will find that it is filling yet it won't weigh you down. It makes for a perfect lunch, dinner or side salad to bring to a Summer BBQ. See below the recipe for my "make ahead" tips! I hope you enjoy this salad as much as I do this Summer! Drizzle of honey, about 1/4 Tsp. 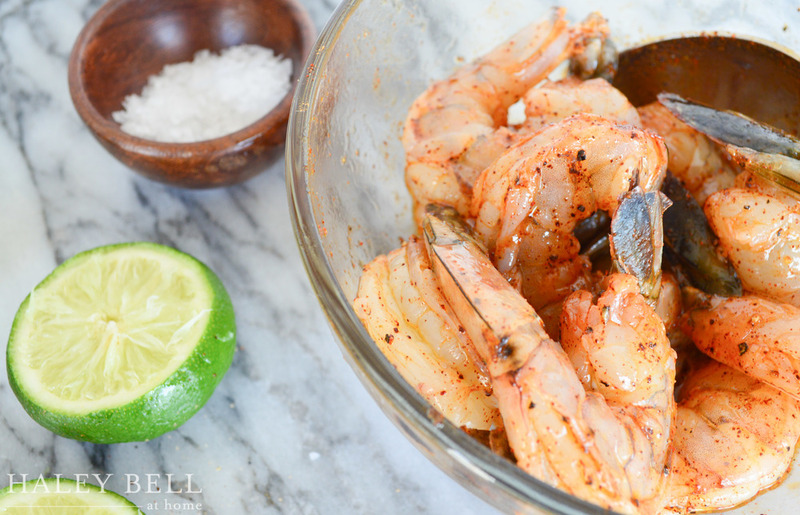 Combine all the ingredients for the shrimp marinade: lime juice, olive oil, chili powder, paprika, Lawry's season salt and ground pepper in a bowl. Add in the shrimp and toss well. Marinate for a half hour in the refrigerator. Rinse and drain quinoa and cook according to box directions. Set aside. Combine all the ingredients for the salad marinade: diced shallot, lime juice, olive oil, honey, ground cumin and salt and pepper in a large bowl. Sit with whisk. 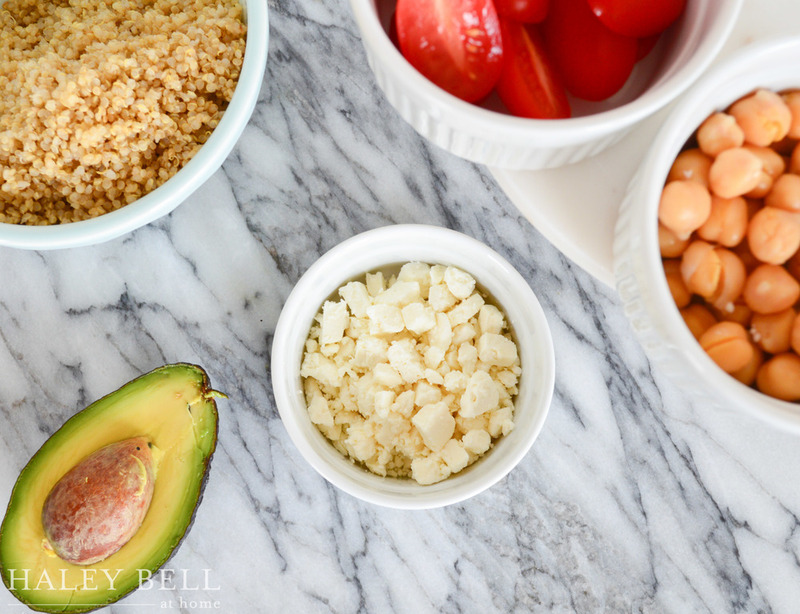 To the bowl, add the cooked quinoa, tomatoes, chickpeas, feta cheese and avocado and toss gently. Remove the shrimp from the refrigerator. In a cast iron skillet, add 2 Tbsp. olive oil to the pan set to medium-high heat. Add the shrimp and cook for a few minutes on eat side until cooked and pink in color. Divide the quinoa mixture evenly among 2 plates. Top each serving with shrimp and serve. Make Ahead Tip! If you would like to make this ahead of time, or are cooking for a large crowd, you can marinade the shrimp and make the quinoa salad mixture (without the avocado) and keep in the refrigerator. 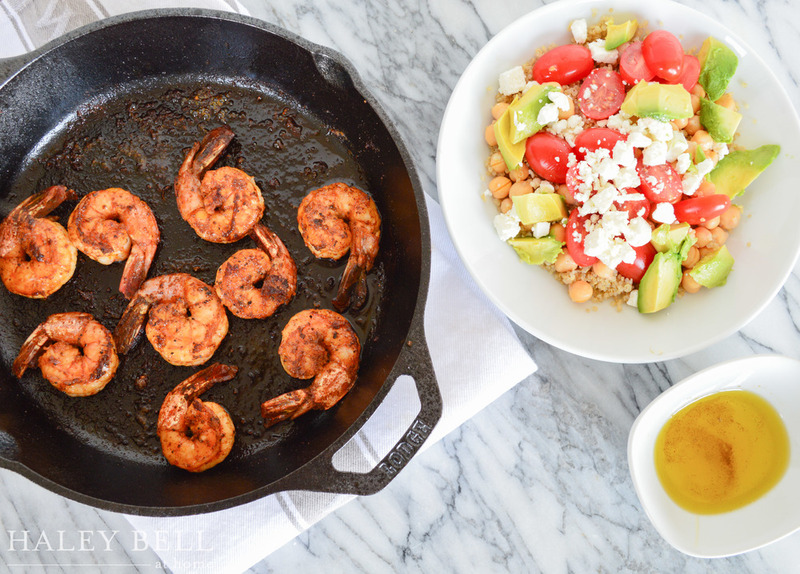 Right before you're ready to eat, cook the shrimp and dice the avocado and serve. Beets are one of those foods you either love or hate. I happen to love them. My husband happens to hate them. I received 3 large beets from our weekly Farm Fresh to You shipment so I decided to roast them up for lunch while he was at work so we didn't have to play the "beets taste like dirt" game. But, the truth is whether you fancy them or not, my roasted beet recipe satisfies all pallets. And, guess what? My husband liked them. What I love about this recipe is that it is super healthy and has a natural salty sweet sensation with the caramelization from the baking process and the sea salt on the finish. They were perfect on top of a fresh bed of spinach topped with feta cheese and a vinaigrette dressing. Next time you are in need of an easy side dish or want to impress your guests with a gourmet salad topper, give this recipe a try! Preheat oven to 400 degrees. Cover a baking sheet with tin foil, spray with cooking spray, and set aside. Wash the beets, remove the stems and peel the skin with a veggie peeler. Cut the beets in 1 in. pieces. In a bowl, toss with olive oil and liberal amounts of salt and pepper. Place on the prepared cookie sheet and roast for 30-40 minutes, stirring occasionally. Remove and immediately toss with red wine vinegar and salt and pepper. Serve immediately for a warm salad/side dish or refrigerate for later use. I am the type of person who needs to snack in between meals otherwise I become what I call “hangry” (hungry-angry). To avoid that from happening, I have some go-to snacks that I am sharing with you today. These three 3 ingredient no fuss snacks are great for taking to the office, in your kids lunch box, a road trip or if you’re out running errands. 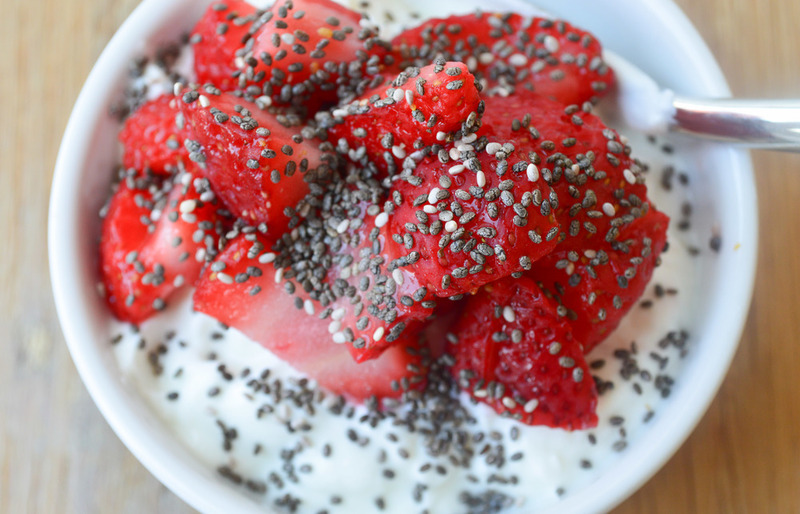 Take your favorite yogurt, top with some sliced berries (or any other fruit) and sprinkle with chia seeds. Remove the skin from half a cucumber and slice diagonally into half inch pieces. 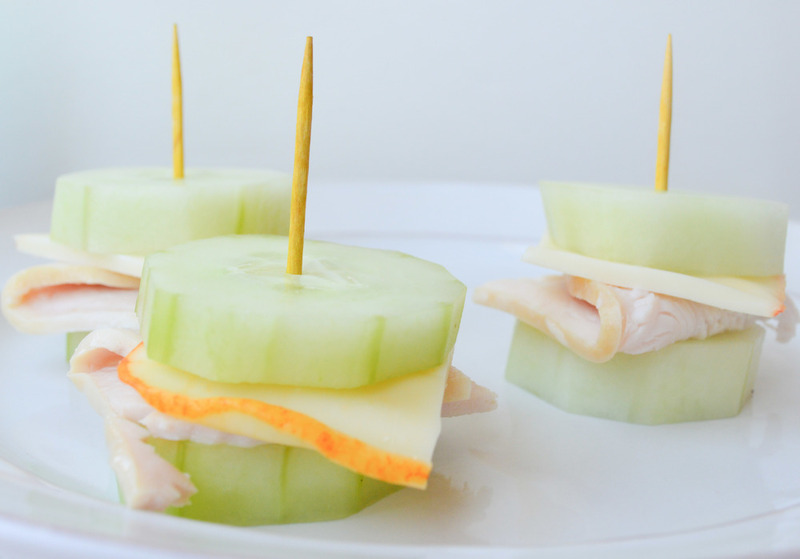 Take 1 piece of cumber and layer on a slice of cheese and slice of turkey and top with another cucumber slice. Peel 1 whole banana and cut up into 1 inch pieces. Take 1 banana slice and smear on your favorite peanut butter (or any other nut butter) and top with another slice of banana. Sprinkle the tops with cinnamon. I hope you enjoy these three 3 ingredient snacks and they help you from getting "hangry"! I would love to know what your favorite snacks are so comment below or tag me on Instagram. Growing up, I never really appreciated the season of Spring. Maybe it was because I grew up in California and we “don’t really have seasons” or maybe it was because I loved Summer due to the fact that there was no school. However, I have grown to love the season of Spring over the years. I love all of the new beginnings the Spring season can bring, the sunny yet crisp days and a whole new crop of fruits and vegetables in season. 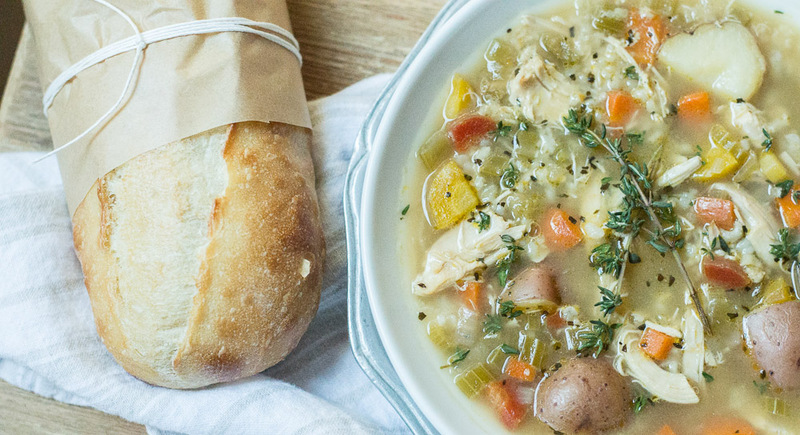 I found this Spring lemon chicken and vegetable soup recipe and since I had most of these ingredients on hand from my Farm Fresh to You shipment and from the Meyer lemons my parents gave me over Easter, I knew I had to try it. The soup was light yet filling and full of nutrients! I love the hint of the lemon with the sweetness from the peas and the tender chicken. You could eat this soup for a light lunch or pair it with a Spring salad and crusty loaf of bread for a main course. I made a few variations to the original recipe. I added seasoning salt (Lawry’s) to give it another layer of flavor, used parsley instead of basil, and used half of the suggested lemon zest. The flavor came out amazing! My husband is not usually a big fan of soup as the main course, but he loved it and was asking for seconds.